If you’re reading this blog post, you undoubtedly know that Tinderbox is one of my favorite pieces of software. The mind-bogglingly versatile and powerful “tool for notes” is unsurpassed for helping me make sense of complex data (complex to me, child’s play to others perhaps). 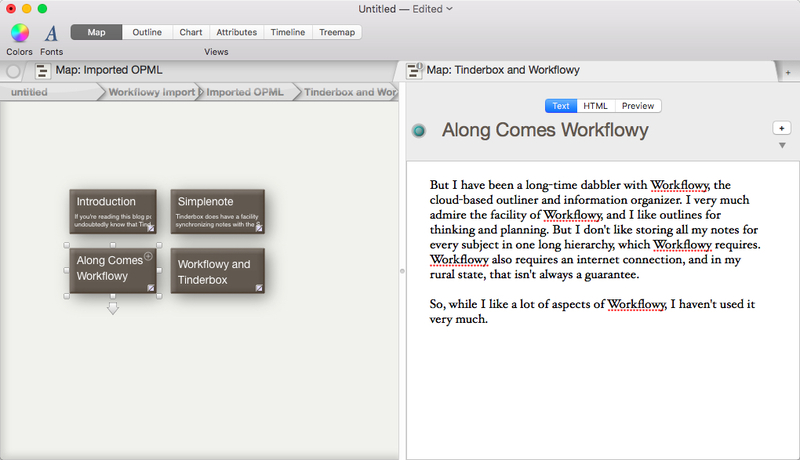 But I do not use Tinderbox as much as I would like for the simple reason that I can only run it on my MacBooks. I spend eight hours a day on my office Windows PC, and am frequently on the go with just my iPad with which to collect and write notes. Consequently, I end up dumping stuff into Evernote, which is terrific for keeping data sync’d across devices, but which does almost nothing for me in terms of analysis and visualization. Workflowy is an adept, universally accessible outliner. 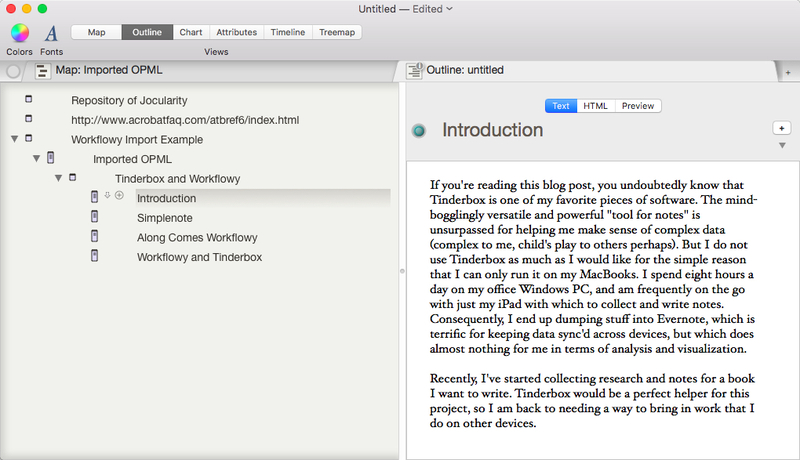 Create an outline for importing to Tinderbox. Select “Export” from the little drop down menu that appears when you click on the bullet icon at the start of the top level of the notes you want to export. Click on the OPML option. Once your outline is ready to go, click on the bullet icon of the parent note. A drop down menu will appear. Select the choice “Export.” When the export dialog appears, select OPML, then just copy that text. 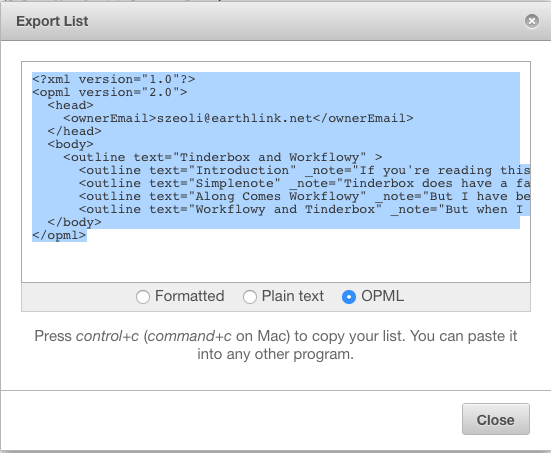 When you paste the OPML text into Tinderbox, a top level note is created with the OPML text in the note. The original Workflowy parent note becomes the parent container note in Tinderbox, holding the original Workflowy child notes. Note text from Workflowy is also imported as the note text of the corresponding Tinderbox notes. Outline view of the notes Workflowy notes imported into Tinderbox. The one somewhat cumbersome aspect of this procedure is the redundant OPML container note, which you probably don’t need. You can eliminate this by copying the parent container note, pasting this where you want it in your Tinderbox document, and then deleting the original OPML container note. Tinderbox now supports tags with a Tag attribute, but unfortunately Workflowy tags do not translate to Tinderbox tags. They just come in as part of the text. You can easily set up agents that will search for these Workflowy tags (just hashtags followed by the tag name as in #WorkflowyTag) and apply them to the Tag attribute of the notes in Tinderbox. It is important for me to point out that this is a one-way process. There is not a way to keep notes in Workflowy and Tinderbox in sync. At least not one I know of. By the way, Tinderbox does support Simplenote synchronization, but I’m not a fan of Simplenote and — at least in the past — I’ve found there to be some restrictions on how you can use the sync’d Simplenote notes in Tinderbox. So that’s it. A simple and easy procedure. Now to put it into practice. 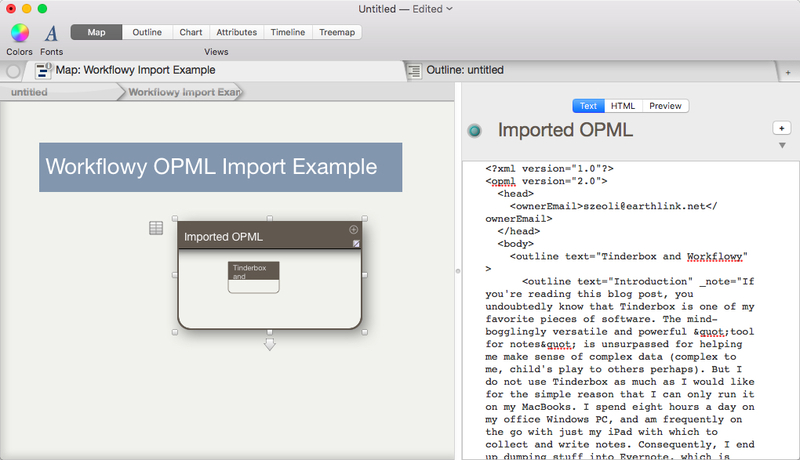 The workflow you describe would work with any app that writes or exports to OPML, so Omnioutliner, iThoughts, MindNode, etc. would do the same thing. Not sure if their tags would fare any better. now that there’s the more powerful iPad Pro, maybe an iOS port of TB will be possible. Also, speaking of iOS, I first read this latest post on my phone with iOS 9. There’s a display problem. Your wood-panel background takes over the screen and I get small dark letters against the wood-grain background. Very hard to read. Sorry for the iOS issue. Not sure I can do anything about that. I use just a standard WordPress theme. Although it might be time for a new look. Thanks for the heads up.